Mobile-First is the new mantra. 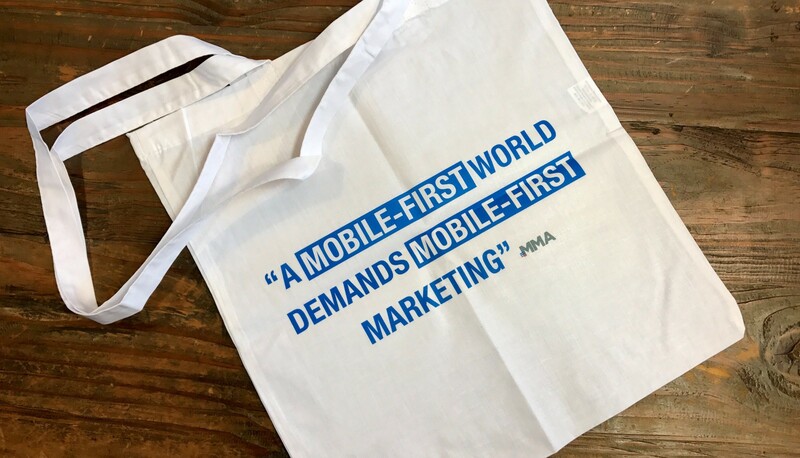 Popular swag from the Safari sums up the MMA mission and thinking about the place and power of mobile in marketing. Attendees leave the upday offices and walk to the offices of AppsFlyer on Friedrichstrasse. The company is focused on the ’dark side’ of advertising: mobile ad fraud in all its forms. A sophisticated form of ad fraud is Device ID Reset Fraud, a scenario where fraudsters automatically reset the device ID of the smartphone in between app installs on a massive scale to collect money from clicking on app downloads and ads. Ben Jeger, Managing Director DACH, explains the fraudulent process (which “has already cost German companies nearly €50 billion”), and presents Protect360, the new AppsFlyer tool that has been successful in identifying and blocking this type of ad fraud. Mobility in the truest sense of the word is just a few doors down, where Coup has its offices. This Bosch subsidiary, an electric scooter sharing company that uses geolocation to help riders in Berlin find and reserve the scooter closest to them on-demand and via mobile app, has been in business since 2016. Superior user-friendliness, an approach in the arsenal of Silicon Valley’s Internet giants, is also a strength that Coup has. Berlin, with trains that frequently run late and a shortage of taxis that make it hard to get around the city, is predestined to be a market for Coup. Last year Coup expanded operations to Paris, where it has a fleet of 600 electronic scooters. At Google tomorrow’s world of mobile it is almost yesterday. “We are moving from a mobile-first world to an AI-First world.” This statement from Google CEO Sundar Pichai in December 2016 sets the direction for the Berlin office of Google, which is likewise convinced business will experience fundamental change as artificial intelligence accelerates the interaction between humans and machines. A prime example that shows how near this future really is: Pixel Buds. These intelligent earbuds can translate 40 languages in real-time. How well this works in the real world remains to be seen. For now, the technology has certainly ‘caught the ear’ of consumers, and that is a start. In Germany Instagram is gaining in popularity. “Many users get their daily dose of inspiration there,” observes Andreas Rau, Head of Media Agencies DACH at Facebook. Instagram Stories are driving growth. The format, which marked its first year on the market this summer, is also equally popular — and successful — among advertisers. More than 1 million companies are active on Instagram, and one-third of the most viewed Stories were created by brands. The secret to this success? According to Rau, it’s all about authenticity — both the content and the approach to mobile. It’s not an easy balance to get right, which is why Rau also provides attendees with helpful tips based on first-hand experience and expertise. “Data is the new coffee.” It’s a strong statement and Daniel Rieber, VP Marketing at mobile data platform provider adsquare, has his reasons. A perfect coffee is made of coffee beans of the highest quality, prepared with professional machines and served at precisely the right moment. (At the company offices in Saabrücker Strasse the services of a real barista underline his important point.) Apply the coffee analogy to the mobile ecosystem and it’s adsquare that takes on the role to deliver quality data at the right time to the proper audience — explicitly and in strong contrast to the ‘walled gardens’ of Google and Facebook. For this reason, adsquare works with partners including Microm, Motionlogic and Wall Decaux. The last stop of the Berlin Mobile Safari is not just snacks and drinks at the offices of Adjust. Head of Sales GSA Niko Thielsch speaks candidly about Adjust and its success in Berlin, where it was founded 5 years ago. Today Adjust has grown to over 200 employees and the company — which operates profitably — has opened offices around the globe — all part of its work to track, measure and analyze key marketing data and activities. The fight against ad fraud is a central focus (similar to AppsFlyer). Above all, Adjust is committed to ensuring that in-app advertising is measured better to deliver marketers greater effectiveness.